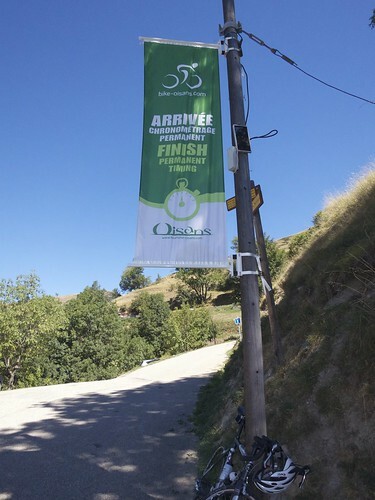 See here for more routes starting at or near Bourg d’Oisans. From Bourg d’Oisans most people take the main road N91 (D1091) to the turn off for Sarenne just below Mizoën – but I took a better way. 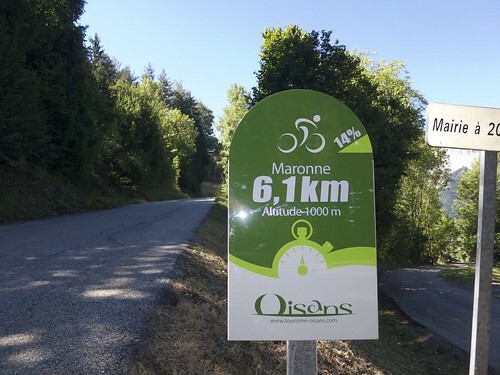 Along the cliff road is a signed turn-off up to the little ski station of Maronne. It’s a 4.5 km extension … with a little gravel on the paved road, I got a flat. With a view of the Alpe’s hairpins I changed it and crossed my fingers that my last tube would last the rest of the day. After descending back to the cliff road I continued to the turn off up to Auris-en-Oisans and turned up for a few more quiet, open hairpins to the ski station. 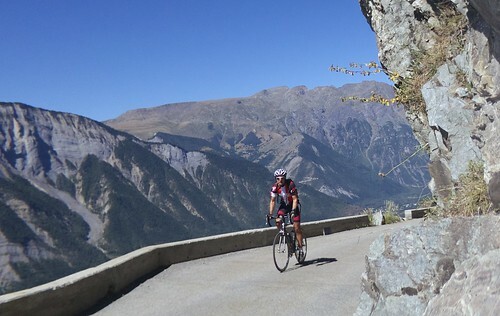 Above Auris are some non-paved roads that lead to a couple of cols and look like really good cycling. 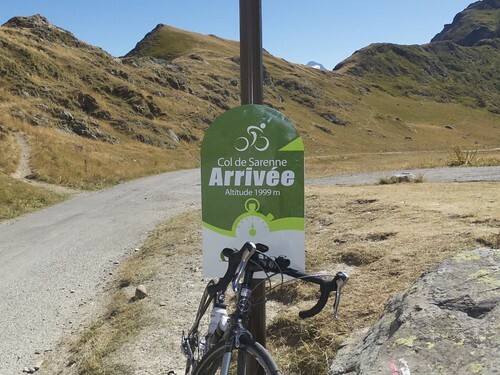 In fact one can get more directly to Col de Sarenne this way … next time! 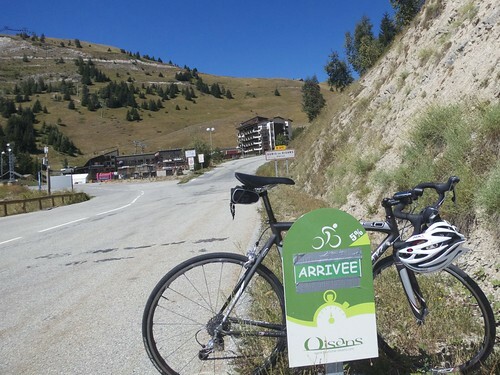 Next I descended to La Freney for a quick “gas station lunch” – then briefly joined the main road for a few kilometres. Just after crossing the large dam at Lad du Chambon is a left turn that leaves the main road and begins the serious climbing to Col de Sarenne. This is the same valley that leads to some excellent high altitude non-paved col hunting – see here. But this was my first time riding up to Col de Sarenne. I had high expectations, and the ride up exceeded this expectations ….. spectacular. After the col the road descends through a pretty mountain valley and the climbs a little into Alpe d’Huez itself. I descended the famous 21 hairpins enjoying watching quite a few riders suffering in the other direction. A thoroughly enjoyable loop, much improved by the early cliff road long-cut. 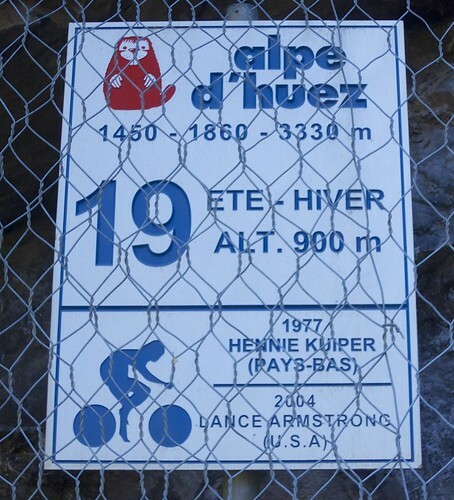 Maybe next time I go to Bourg d’Oisans I’ll cycle up Alpe d’Huez again, but probably instead I’ll explore a couple of other climbs in the region that I’ve yet to cycle. While you could do this loop in either direction, going up Col de Sarenne is the better way to visit Alpe d'Huez. We did this route in June 2017 from our B&B in Le Garde. The cliff roads (the one from Le Garde as well as the one across the valley to Villard Notre Dame) are spectacular and quiet. Editing note: the ski station etc is Auris not Ausis. 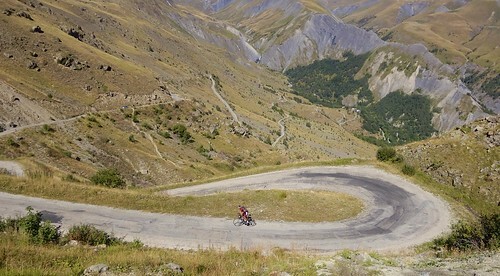 The Col du Sarenne was a highlight of our trip this year. We did a good part of this ride September 2017 and absolutely loved it. Started in Mont-de-Lans with a descent to the dam then a climb thru Mizoen. Took a detour to Besse because we’d heard great things about the bakery there. Bakery was closed, but that was no reason to ignore Besse – a delightful village. Back to where we took the detour and headed upwards to Col de Sarenne. Traffic levels dropped from low to almost non-existent. What a relaxing alternative route to Alpe d’Huez. Had to end our ride at Le Bourg (alas, it was rental bike return day) but did manage to take in the cliffside drive from La Garde. Spectacular. I flatted on Maronne too! WTF with that road. Rode this 21 Oct 2017 and the bottom third of Sarenne has a lot of road construction. There is a utility ditch up the middle of the road for quite a ways and there is a lot of gravel on the road. Not too bad going up but I think it could be sketchy on the way down. Thanks for the great site and if I can drop off some beer for your on my way down to the Alps next time lemme know!